I have two pieces of excellent news for you today! 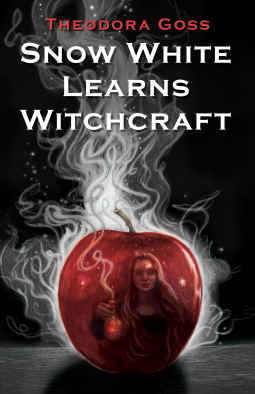 The first piece of excellent news is that Theodora Goss’s collection of short fiction and poetry, Snow White Learns Witchcraft, is available today! And the second piece of equally excellent good news is that if you’re not quite sure about buying this collection, a few of the stories I mention below are available to read for free online. I’ve helpfully provided links, which #sorrynotsorry, will make you want to buy the book. Also, have I mentioned how awesome Theodora Goss is? I am still trying to figure out how Goss crammed so much top notch story telling into this slender little book of just over 200 pages. There is flash fiction, short poems, longer stories, stories that make me giggle, others that made me think deep thoughts, others that were simply joyful to read. You’d think you could zip through a 200 page collection in a day or two, right? Yeah, you’d be wrong. This is one you want to savor and slowly dip into, enjoying the beautiful prose that will greet you on every page. Don’t rush your way through, enjoy your walk through the forest, keep your eyes open for any wolves or taking bears, and allow yourself to be lured in. And ok, can we talk about the poetry in this collection for a minute? I am freakin’ terrified of poetry. Half the the time I just don’t get it, half the time I spend so much time stumbling over the meter enforced word choices that I don’t even know what the sentence means, and the other half the time i just don’t enjoy it. Poetry is clubhouse I’ve never known the secret password to. And now Theodora Goss has me all turned around in the best possible of ways. These poems are photographs, they are short stories until themselves where the idea is more important than the meter. I’d classify them as songs or vignettes before classifying many of them as poems. Sorry if I just insulted all the poets reading this. Thanks to this collection, I feel more comfortable reading poetry, I now feel like I can get something out of it, that there is a story in there for me. This book is my secret password to the poetry clubhouse. Diamonds and Toads which tells a story about two sisters one who has a positive attitude so gets diamonds, and other who has a negative attitude so gets toads, and how maybe the two sisters are actually one person and that none of us are completely positive or completely cranky, and it’s the balance that helps us live full lives. Diamonds come in handy, but it’s amazing how often toads come in handy. Thorns and Briars, which is a poem you can read in under 60 seconds. I like this one because it starts out as a fairy tale or myth might, where some is locking their heart away for the right person to find. And then, well, life happens, and the right person does claim her heart. Goldilocks and the Bear, which tells an endearing story about how Goldilocks really met the bear that she ends up marrying. Apparently I just love stories about thieves and bears and honey and people realizing it’s ok to be vulnerable and living happily ever after and that a strong relationship means knowing your partner isn’t perfect and will never be perfect, and that’s kind of what makes them perfect.